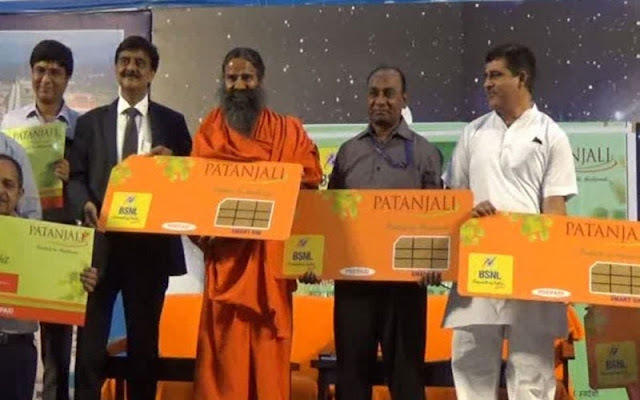 Baba Ramdev launches Patanjali SIM card, 2GB Data In 144 Rs With Health-Life Insurance: Baba Ramdev has entered into the telecom sector. Ramdev has launched a SIM card at an event on Sunday. It has been named as 'Swadeshi Prosperity Sim Card', which has been launched jointly by Patanjali and Bharat Sanchar Nigam Ltd. However, in the recharge of 144 rupees, the user will get 2 GB of data and unlimited calling facility. Also, this SIM will get 10% discount on Patanjali Products. In this case, the user will get unlimited calling facility on recharge of only 144 rupees. Also 2GB of data and 100SMS will be provided to users. The SIM is currently only launched for Patanjali employees, but when it is launched for all, this sim card will be given 10% discount on Patanjali Products. Not only this, the users using this sim will be given 2.5 lakh medical insurance and up to Rs 5 lakhs of life insurance. However, Ramdev said that insurers will be covered only on road accidents. 0 Response to "Baba Ramdev launches Patanjali SIM card, 2GB Data In 144 Rs With Health-Life Insurance"